One of the services I hope to deliver with this site is to provide anyone who wants it free clip art from the early 20th Century. Much of this art, created by graphic artists of 90 to 110 years ago, is great stuff that can be used today. 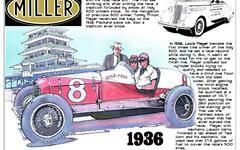 Check out the home page of firstsuperspeedway.com and the art at the bottom of the page. These sketches were originally in newspapers from the early 1900's. I photocopied them from microfilm, scanned them into a JPEG and cleaned them up in a Windows photo editor.